People protesting council's decision to limit participation at open forum. People are upset about council voting last week to only allow members of the public to speak once a month during its open forums. Some protested what they saw as an infringement on their free speech by wearing tape over their mouths for hours. 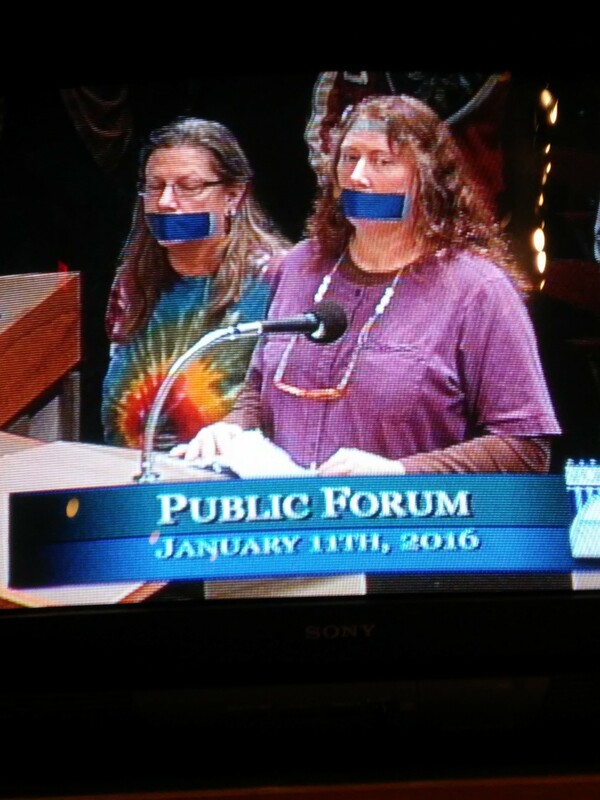 One woman appeared during open forum and stood in silence with tape over her mouth for three minutes. In a win for Council President Ben Stuckart and his progressive allies, the council finally passed an ordinance mandating that most employers allow employees to take paid time off to deal with illness of domestic violence. A controversial initiative petition has been shelved — for now. Spokane City Council approved on a 6-1 vote a long sought after ordinance that requires that most employers in city limits to allow their employees to accrue three to five days of paid time off that can be used to recover from an illness, care for a sick family member or deal with a domestic violence situation. The ordinance has been in the works for two years. It was unveiled last spring with the hopes that it would be passed by the summer. But divisions in the council’s dominant liberal bloc derailed those plans. Now, with the liberal bloc expanded to a 6-1 majority as a result of November’s election, it was finally passed over the objections of Mayor David Condon, who sent a letter last week outlining his concerns. “Business within the city will be subjected to a burden that those in neighboring cities are not,” he said at a press conference yesterday, where he asked for the ordinance to be deferred saying the issue was better addressed at the state level. However, with the ordinance being passed with a veto-proof margin, the mayor has little recourse. In the letter, Condon said the ordinance could raise potential legal issues by conflicting with other labor laws and would be costly and complicated to enforce. Councilman Jon Snyder, at his last council meeting before resigning to take a state job, said that the ordinance wasn’t about a handout, but instead was about preventing people from losing their jobs and potentially falling into poverty or homelessness because they had to take time off to deal with illness. The final ordinance, which exempts the building trades industry and makes room for shift-swapping, was amended several times before it passed. Snyder attempted unsuccessfully to expand the ordinance to allow for five days of leave annually. Councilwoman Karen Stratton successfully amended the ordinance to exempt new businesses of its requirements for a year and that businesses with more than 10 employees had to allow the employees to accrue up to five days of leave. Smaller businesses only needed to allow three days of time off. Snyder opposed these amendments, saying the ordinance was already “watered down” and that council was complicating it. The ordinance was also amended to remove requirements that employees produce a doctor’s note to access their leave. Council members spent much of last year reaching out to Spokane’s business community about the ordinance. But the council still didn’t have their full buy-in. Erik Poulsen, the public affairs director for Greater Spokane Inc., told the council that businesses are proud of what they do for their people and weren’t opposed to paid leave. Instead, they worried that about the cost and enforcement of the new ordinance, he said. “The reason I wanted to come talk to you is because I’ve seen there is a lot attention being paid to the adversarial relationship between businesses in Spokane and government,” he said. Michael Cathcart, lobbyist for the Spokane Home Builders Association who sat on a task force that helped craft the ordinance, thanked the council for exempting the building trades industry because it’s a seasonal business that makes tracking hours difficult. He also asked the council to look into more small business exemptions. 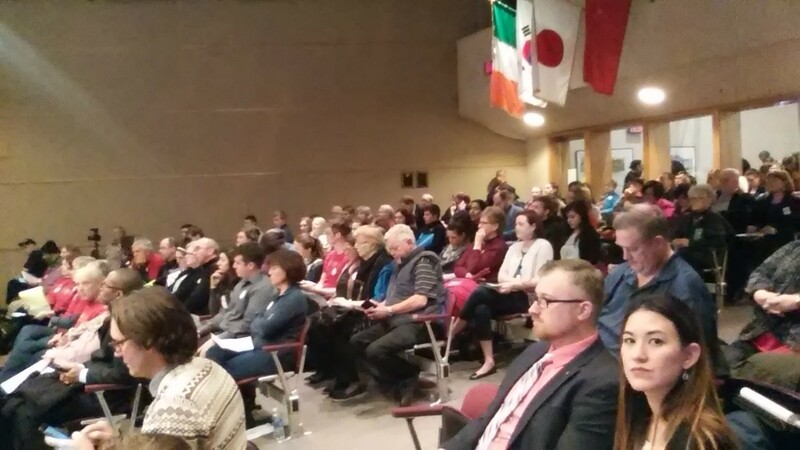 Council chambers was packed primarily with supporters of the sick leave ordinance. The majority of the 50 plus people who showed up to speak on the ordinance favored it, telling stories of children going to school sick because their parents couldn’t take a day off, employees having to work while injured or workers losing their jobs because they fell ill. They also heard from a few owners of small businesses. Paul Lugo, the director of the medical marijuana dispensary the Herbal Connection, said he gives employees time off to deal with illness, but he opposed a government mandate. Regina Malveaux, CEO of the YWCA of Spokane, told the council that sick leave is a top legislative priority for her organization. She noted that locally the YWCA works closely with working poor women and that for many of them getting out of an abusive relationship is made more difficult by not being able to get time off of work. “I had two advocates share with me that just in the last months there were two victims who declined to work with prosecutors in our family justice center because they simply could not commit to the court dates that were part of that process,” she said. As the marathon council meeting wrapped up, Stuckart told a story of how his father was dying during 2014. If he didn’t have sick leave at his job, said Stuckart, his father would have died alone. And that, he said, was reason enough to pass it. Supporters of an initiative petition seeking to overturn a city ordinance that restricts when city employees and police can inquire into someone’s immigration status will have to start over or get a lawyer. Last night, Spokane City Council took the unprecedented step of leaving the petition in a state of indefinite legal limbo. The petition drew enough valid signatures to qualify for the 2017 general election ballot. However, its sponsor, Jackie Murray, asked last month to formally withdraw her name from the petition after having a falling out with the head of Respect Washington, a Western Washington group seeking to curb illegal immigration. Stuckart, an opponent of the petition, said at the meeting that the municiple code is silent on how to handle the unusual situation. Under the municipal code, if a petition qualifies for the ballot, the council can either vote it into law or send it to the ballot. Stuckart said that the council’s lawyer advised it to simply take no action, meaning supporters would either have to start over or take the issue before a judge. During the public comment period, Rick Eichstaedt, the executive director of the Center for Justice, told the council to vote to keep it off the ballot because the petition contained added language in violation of city code. “It affects my community’s ability to call the police and know that nobody is going to target them with questions that have nothing to do with crime,” he said. 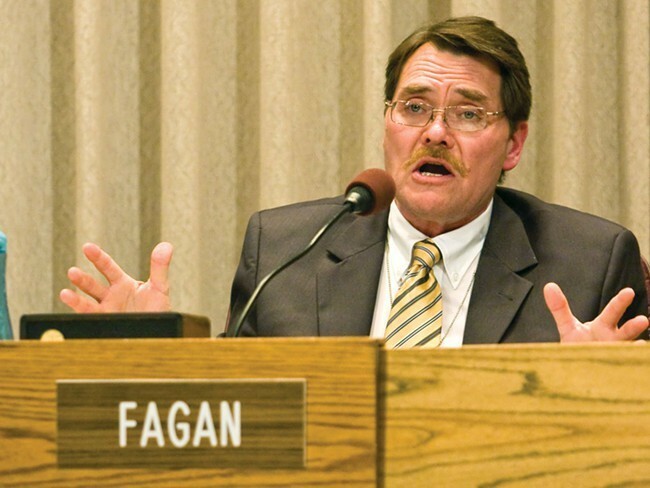 Councilman Mike Fagan, the council’s sole conservative, said the people who gathered signatures for the petition were not motivated by racism. He said that the state was facing an “illegal alien, open-border situation” and that a 2012 Federation for American Immigration Reform study concluded cost Washington state billions in public benefits to illegal aliens. He said illegal immigration was contributing to a drug problem in Spokane County, particularly with heroin and opioids. He also objected to council refusing to send the petition to the ballot. “I would like to appeal on council to not deny democracy, to not deny an opportunity for those who were anticipating and expecting this government to perform its paramount duties and preserve and protect the right of its citizens, the U.S. citizens, that we represent,” he said.